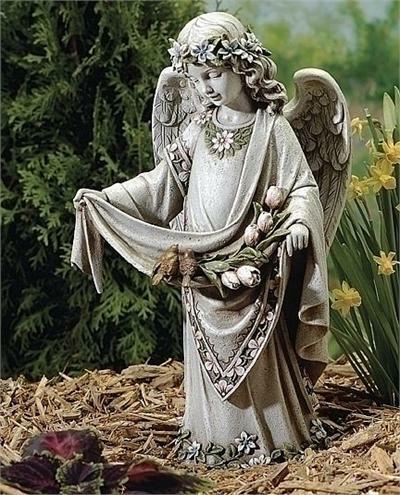 One of our beautiful angelic inspirations for the garden includes this lovely sculpture of an angel girl looking so serene and lovely as two birds watch her on. She is beautifully detailed and comes dressed in a beautiful gown as shown. Our garden angel bird feeder gracefully holds her skirt to feed your birds. Resin. Comes with pastel finishes as shown. A sweet angel holds out a large flower which acts as a bird feeder in this angel bird feeder statue. Resin.